You can’t ignore a bill from the IRS the way you might be able to ignore a bill from the power company. The IRS won’t report you to the credit bureau and make it harder for you to get a loan or a cell phone. Instead, the IRS will take drastic action that can include everything from steep penalties to seizing your property. Before you have to call a tax collection lawyer in chandler, AZ to handle your case, you need to take action to either pay your bill or arrange a payment plan. A tax lawyer can also help you negotiate a repayment plan or a settlement. You may also be eligible for an offer in compromise or potential bankruptcy to discharge the taxes. To start, the IRS will send you a letter in the mail letting you know that you owe taxes. The notice will include the amount you owe, the date the amount is due, and what interest or other penalties have been assessed on the account. If you do not pay the amount due on time, you will get another notice – likely with additional interest or penalties applied. You will typically get three notices before the IRS moves onto other collection efforts. Sometimes, you may get more than three notices, but you shouldn’t count on another notice if you’ve already received three. It’s better that you take action as soon as you can to resolve your account. If you have failed to respond to the notices the IRS has sent you, and if you have failed to make acceptable payment or arrangements to pay, the IRS is likely to move onto placing a lien on your property or seize it. A lien means that you will not be able to buy or sell any real property in the county in which the lien was filed. A levy refers to actual seizure of the property. For example, if you owe enough, the IRS can actually take your house and sell it at auction to recover what you owe. At this point, an IRS attorney may still be able to help you negotiate a settlement so you can avoid having your property taken. However, you should take action before collection efforts get to this step. Waiting until this point to contact a tax attorney limits your options and puts you at risk of losing valuable assets such as your home, vehicles, business, or precious jewelry. The IRS can also garnish your wages or seize other income, including future tax refunds that you are owed, inheritance, or personal winnings. The IRS cannot seize worker’s compensation, child support payments, some welfare benefits, and some pension benefits. However, things like your 401(k) or savings accounts are definitely up for grabs. You do not have to give permission for the IRS to take these actions. You will simply receive a paycheck with far less than you expected. Fortunately, there are several things you can do to deal with your IRS tax bill without losing your personal property and savings. But it’s important that you take action early and not try to avoid the notices. You may feel like you can’t afford what you owe, but the IRS is typically willing to arrange an affordable payment plan that will not place undue hardship on you. Working with a Chandler tax collection lawyer can help. Your tax lawyer can negotiate on your behalf, helping you to get lower payments or even getting some of what you owe dismissed. For example, your IRS attorney may be able to file an offer in compromise if there is any doubt as to your liability for the amount owed or as to your ability to make full payment. The offer in compromise would have you paying less than what the IRS originally charged that you owe. In some cases, you may be able to get the entire amount dismissed if you can show that paying it would cause an undue hardship. You can even file for bankruptcy to stop collection efforts and the amount may be subject to bankruptcy discharge. 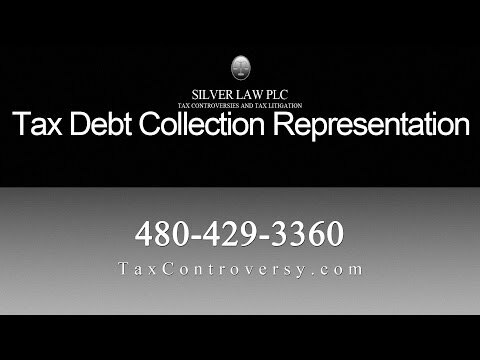 Talk with an experienced tax lawyer at Silver Law PLC in Arizona to learn more about these options and what strategy would make the most sense for your circumstances. Our tax collection lawyers have experience working for the IRS, so they understand how these cases are treated from both sides of the aisle. They will work hard to help you minimize your tax debt and to protect your assets. Our attorneys also help clients with matters including tax litigation, foreign tax reporting, innocent spouse relief, and criminal tax charges. Call us in Arizona today to talk with an experienced IRS attorney about your case.